SCENARIO: we’ve all just watched Virginia end Nebraska’s Cinderella run in the championship game, 61-55. Virginia probably wasn’t the team many expected to win it all. 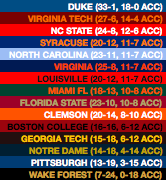 Having limped through ACC play, including a 3-game losing streak in mid-January and being swept by both Duke and Virginia Tech, they finished 11-7 and in 6th place. After a run to the ACC Tournament semifinals, a 25-8 Virginia team still has a good enough résumé to get a #3 seed in the Midwest Region, behind Michigan State and Gonzaga. Meanwhile, Duke ran through the entire ACC schedule unbeaten and then won the tournament too! At 33-1, they are the #1 overall seed in the tournament by a mile. Nebraska, for their part, had a pretty darn good run through a pretty tough Big Ten. They finish 14-6, but that includes a 9-1 record at home. 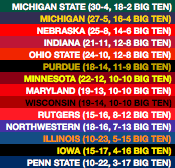 While there are some bad losses, @Illinois and @Rutgers, they still finish 3rd in the Big Ten. They enter the tournament ranked #12 in the AP poll, and get the #4 seed in the West Region. Michigan State went a sterling 18-2, finishing 30-4 overall and ranked #3. They get a #1 seed, and Michigan gets a #2. The other two Final Four teams are both from the SEC. 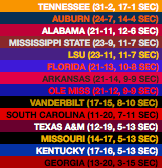 Tennessee blitzed through their SEC schedule, going 17-1 with only a surprising loss to Texas A&M on February 2. That included a run through the SEC tournament, culminating in a big win over 7-seeded Arkansas in the final. Auburn finished three games back at 14-4 and in second place, although the race wasn’t decided until Auburn lost in Tuscaloosa in the second-last game of the season. Tennessee goes into the tournament at 31-2 and ranked #2 in the country, and are an easy choice for a #1 seed. Auburn, at 24-7, gets the #3 seed in Duke’s East Region having been ranked #10 in the AP poll. Meanwhile, it’s an abject disaster in Lexington as Kentucky implodes and finishes 13th, ahead of only Georgia. I can’t simulate coaches being hired and fired on this thing, but I can’t imagine John Calipari survives that. Despite not having a team reach this year’s Final Four, it’s still the Big XII that finishes on top as the highest-rated conference overall. The real story here, though, is the end of Kansas’ reign atop the conference. Not only is their streak of championships stopped on their bid for a 15th, they finish FIFTH in the conference with an 11-7 record, three games behind champions Iowa State and also ranked behind Texas, Oklahoma and Texas Tech. Losses to Oklahoma State at home, and K-State and a suddenly bad Kentucky away from home, define the rest of the Jayhawks’ regular season. Despite all that, they’re still ranked #15 in the AP poll going into the tournament, and we all have to pretend to be shocked when they get a #3 seed in March, perhaps the committee’s way of trying to correct for talent. In a year when the status of best team in the Big East is hotly debated between Villanova and Marquette, it’s neither of them who actually wins the conference by two full games. Instead it’s surprising Creighton to take this crown, finishing 14-4. They rack up a number of quality wins, including a sweep of Marquette, to win the title. Despite being pummeled by Butler in the Big East tournament semifinal, the Bluejays run into March with a #5 seed, same as Villanova gets. As you’ve likely heard at this point if you’re following college basketball, it’s a pretty rough year for the Pac-12, with many people openly questioning whether anyone in the conference will merit an at-large bid. Turns out, two teams do: both Arizona and Oregon get through, and tournament champion Washington was safely in anyway as well. The surprise team of the Pac-12 season is 12-6 Oregon State, who many people believe would have made the tournament if they’d beaten Washington in the conference tournament semifinal. Unfortunately they didn’t, so the Pac has to settle for those three bids. Arizona State finishes 5th at 10-8, not good enough to qualify either. No Pac-12 team is ranked in the final AP poll, although both UA and UW are close. Finally, the American conference. Houston, at this point in January, is one of three remaining undefeated teams in Division 1, and for the Cougars that streak lasts until the 27th. They reached 20-0, and a top-10 ranking, but are tripped up in a loss to Tulsa on that day. They keep on winning at a good rate, though, and by the time they beat Cincinnati for the second time on the last day of the season to win the conference regular season title outright by a single game, Houston is ranked in the top 5. When they then win the conference tournament as well, the nation is suddenly surprised by the prospect of Houston perhaps getting a #1 seed, and that’s exactly what happens. They pick up the 4th and final #1 spot, in the West Region. Others: Nevada wins the Mountain West comfortably at 16-2, losing only at Utah State from this point. There is some bid thievery afoot there, as Fresno State upsets them in the tourney final to secure a second bid for the MWC. Unbelievably, the MAC is a 3-bid conference this season, as the committee can’t bring itself to omit a 28-4 Buffalo or a 27-5 Toledo, despite Ball State being the conference’s AQ. Those two split their games with each other and combined for 29-3 against everyone else, so they get in (with Toledo being one of the last four in). The WCC also becomes a two-bid league when St. Mary’s upsets Gonzaga in the tournament semifinals, and they defeat San Francisco in the final to get in. The final multi-bid conference is the A-10, with a 27-7 VCU team sneaking in as one of the last four teams in the field. This is a pretty tame tournament, to be honest, with 11 of 12 top-3 seeds making it to the Sweet 16, but the run made by Nebraska from that point to the title game is remarkable. Remember, to this point, Nebraska has NEVER won a game in the NCAA tournament. They’re the only Power 6 conference school that never has, so to win five tournament games this year would be an unbelievable result for them. That’s it for this Season Sim! This is just one way that this 2019 season could wind up – I’ll be back with another on Wednesday. Stay tuned for a new top-25 power ranking discussion tomorrow and more Bracketology on Wednesday.